All bidders need to register by completing the online form and providing all required information, such as their full name, contact information, and credit card details. We will communicate the status of your registration via the email and contact information you provide. Select your bid amount as long as it is greater than the last bid shown on the bidding screen, then click the “Bid” button. This will automatically place your bid. How can I watch the auction? Bidders will receive an email to confirm when their bid has been received, and an email to notify them when they are outbid. After the auction, winning bidders will also receive an email to notify them of their winning bid. The winning bidder will receive an email after the auction with instructions for how to checkout and pay for purchased item. Sign up here to receive live updates on the auctions process. A month after launching, the advertising space on The Erased Rauschenberg had been completely sold! 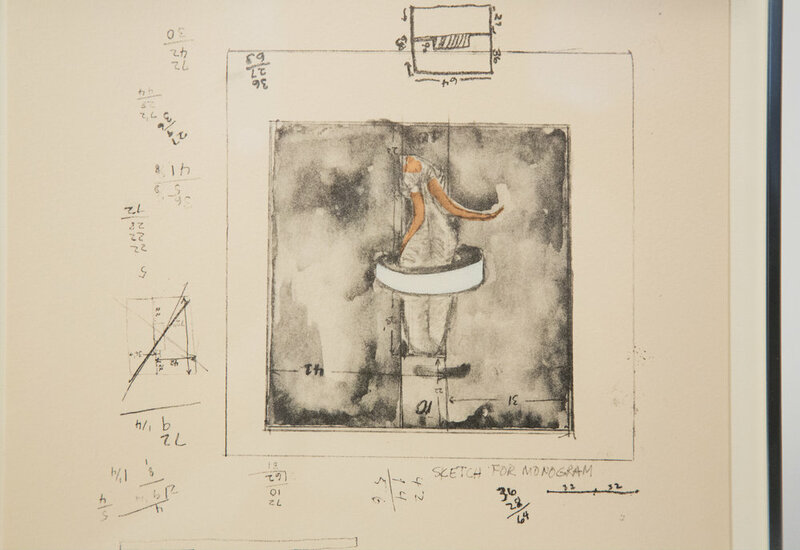 All of the proceeds from the sale of the Erased Rauschenberg will go to the New Museum’s incubator for art, design and technology, NEW INC. The funds will create a scholarship for members who require financial assistance. I am currently an artist at the New Museum's art and design Incubator, New Inc. Stamped on verso "© Copyright 1973 By Robert Rauschenberg Printed by Styria Studio"
The piece is signed by rauschenberg. A drawing of his famous Monogram sculpture.